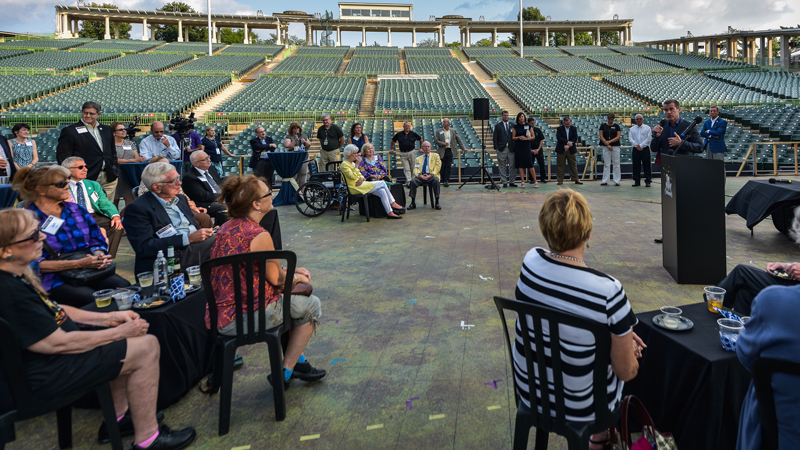 The Muny announced today a remarkable pledge of $20 million from The JSM Charitable Trust for its Second Century Capital Campaign. This fundraising effort will fund major capital improvements, including a complete rebuild of the Muny stage, the support, maintenance and upkeep of the aging 11.5 acre campus, and the building of the theatre’s endowment, which supports The Muny’s ever-growing education and outreach programs. This announcement was part of The Muny’s official kick-off event, Intermission: Setting the Stage for the Next Act, for the upcoming stage renovation. Major donors were invited for an intimate evening onstage that included brief remarks regarding the Second Century Capital Campaign and the upcoming major renovations to the theatre.